I combined ideas from two cards I saw to make this , and I'm super happy with how it turned out. I think it's my fave for right now, lol! I'll have to make another to look at because this one is going in the mail tomorrow for someone who's celebrating the big 4-0 milestone. The branch and bird are from a new set in the SU Holiday Mini called Season of Friendship. I cut off a branch because the whole tree is quite large! I used the Simple Alphabet from PTI for the sentiment, which reads: getting older is for the BIRDS! I think the rest of the card is self-explanatory, but don't hesitate to contact me if you have any questions. ... but it sure beats the alternative! Love this one Becky!! Beautiful colors and I love that bow!! Super cute Becky. Love the use of the Simple Alpha! Great colors! You definitely have to make another one to stare at!!! great colors and i love the layout/set- everything!! I just got this set yesterday and I NEVER would have thought to use just one branch!! This is awesome, Enabler....I mean, Becky! Love the bow and the colors!! Wow! Those colors just POP! I love this! Love, love, love this!! 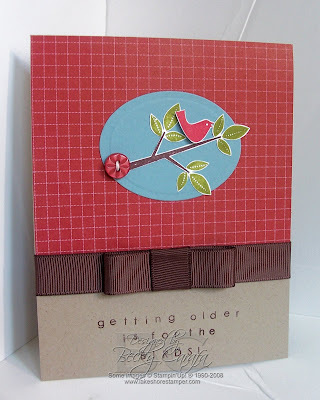 Great mix of colors and paper, sooo cute! I wasn't sure about this set, but now you've convinced me, I definitely do need it! OMG!, Becky this is beautiful. I love everything about it. great card and the colors rock.